Most often when I write about training, it’s in the context of physical training for the sports that I do, but today I’m thinking about the other training that I do in business writing. I run writing and tone of voice workshops, to help people connect with their customers with communications that sound like they come from human beings rather than nameless, faceless organisations. As many of the people who attend are in customer support roles, these sessions are always about how we speak as well as how we write. And increasingly I’m being asked to offer advice on things like webcasts and social media platforms as the range of ways of communicating expands. I’ve had the benefit of some really excellent training throughout my working life. At the BBC it was often technical and skills based as I learned how to edit, first on tape and then digitally; how to ‘drive’ a studio desk; how to interview and construct radio packages quickly. Later I would learn digital skills, working on websites, using basic HTML, photo manipulation, and content management skills. I realised that I really enjoyed it too. I was there long enough to see people I’d trained passing on what they’d learned to others. I get a real kick out of that. I have a little training mantra: “See one, do one, teach one.” I probably stole it from a medical drama, most likely ER. But I’ve found it really works, as you really know and have confidence that you know how to do something when you can teach someone else. In my last blog post, I talked about having doubts and insecurities as a writer. When I’m doing a training session or workshop, if I have any, I can’t let them show. I have to have confidence in my knowledge and ability to deliver the materials and to make them interesting. Not every workshop is perfect. Some are better than others. But the participants will never know if I rushed through an exercise because we were short of time, or handled a question differently the next time I was asked it. Sessions can be tricky when I’m expecting a room full and only a handful turn up. I have to mentally rejig how I’ll manage small group discussions as they take their seats and adapt as I go. Or when I get the sense that people have been told to come to a workshop, but don’t know why. Sometimes I feel like a stand-up comedian in front of a tough crowd. I just have to believe in my material and keep going, while trying to find the level of the room. The best sessions are when people are really engaged and ask questions or challenge points I make. When they ask ‘Why?’ or say “But we have to do it like this…” I know they are taking an interest and I have a great opportunity to make that session really relevant. Most writers are magpies. We steal inspiration, words, phrases and ideas from anywhere and everywhere, then make them our own. I do the same with training courses. And once again, I’ve had the benefit of some excellent ones, from Dark Angels, 26, The Writer and Scarlett Abbott, to name just a few. 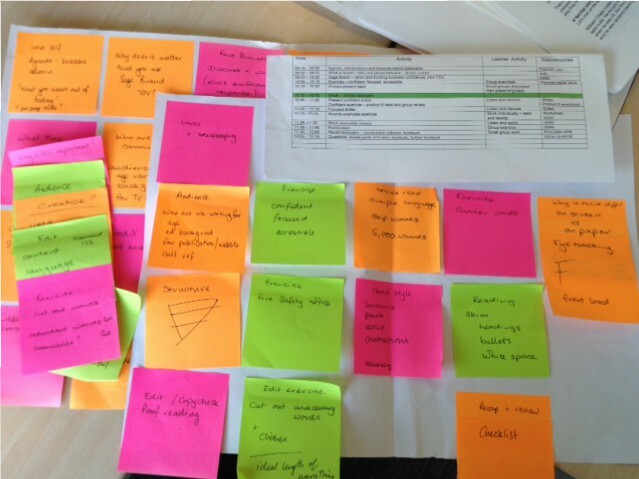 From classroom based to online learning – as well doing my own learning, I take notes and reflect on the content later. Was there a good ice-breaker? How was the session structured? How was the information presented? And when I can, I’ll pick the brains of other people who do training sessions. They are always very generous. I’ve got some sessions with finance teams coming up. So right now, I’m gathering materials, thinking about aims and objectives for the sessions and looking forward to putting them together. No one taught me how to be a trainer, or how to put together a workshop. I’ve learned by watching, listening, thinking and doing; through experience and analysis. I’m always looking for things that I can learn from, so I can improve my skills as a trainer. What are your top tips for training? Aside from last weekend’s tri, I’ve been focusing more on running recently, building up my long runs week my week to get ready for the Great North Run. I didn’t run it last year, preferring to focus on triathlons instead. And for most of the summer, I didn’t miss those long runs at all. But as the event approached and I heard friends talking about doing it, and reports on the local news, and the excitement building, I did start to feel a bit left out. And when I stood on the Tyne Bridge, just after the first mile to see the elites and then everyone else come through, I did feel like there was a huge party going on, and I hadn’t replied to the invitation. So, yes, I know, it’s not everyone’s cup of tea. It’s expensive, crowded and not pretty. But it really was my first big challenge. It’s in my home-town and yes, it means something to me. So this year, I’m back in. I’ve found it quite hard to increase the running mileage, and often struggled to fit in the longer midweek runs, which for me, mean waking early and getting the miles in before work. This week I’ve made an effort to get all the weekday runs in too. I ran 12k (7.4 miles) before breakfast on Wednesday and then another 14k (8.8 miles) on Friday, and today, I managed 12 miles – which I’m very happy with. I opted for a route I haven’t run in years. It takes in the coast, then heads inland along trails through Holywell Dene, to emerge on a long straight stretch of a former coal waggon way, before emerging out on the coast again. Today there was no pace, just easy, easy. This was all about time on my feet after a week of long runs. I listened to music again for the first two and last two miles along the tarmac I have run so many many times before. Then I let my ears free in the woods and trails, greeting every runner and walker I passed on my way. My feet felt tight at first, with a worrying pull in my right calf that I hoped would ease as my muscles warmed up. Easy, easy, easy I kept telling myself. You have a long way to run today. But I kept thinking of my friend Susan Lynch, doing Ironman Copenhagen today. I’m sure she’d have loved only to have to run 12 miles! The sun shone and I was glad of the sunglasses, that later sat atop my head as I drifted in and out of the trees’ shadows and sun drops. Some of the paths needed my full attention to keep sure footing as they undulated up and down, with a couple of styles and gates forcing changes of rhythm at regular intervals. I ran all but the last climb out of the Dene, which came at about 7 miles. I’d made the switch to miles for distance and pace on my watch, and taken jelly babies to give me a sugar boost. I tried to anticipate my usual dips in mood, at around 3, 6, 9 and 11 miles and they seemed to work very well. When I hit the coast again just short of 9 miles, I knew I’d calculated the route distance well. At 10 miles, I was in unknown territory, at my furthest distance since 2012, but I felt good. Yes, my legs were aching, but my head was in a good place, and I was ready to finish a good week’s running. I pushed on a little beyond the 12 miles to reach my favourite stretching spot by a shelter overlooking the beach, and congratulated myself on having achieved what I’d set out to do. I do still have that focus and determination that marked my early runs if I choose to apply it. And I’ve added to that both my own experiences and the collective wisdom of my running friends. Right now, I feel much readier and more confident than I expected to be. Of course, lots could happen in the next couple of weeks. And you never really know until race day how you’re going to feel, how the weather will affect you. But I’m starting to get a bit excited, and a bit hopeful that I could have a decent race after all. In the early days of starting running, I often used to listen to music. It helped block out the sound of my own heavy breathing as much as anything. But as I got more experienced, more confident, and started taking part in races, I stopped relying on it as a crutch to get me through a run. These days, I very rarely choose to take music with me. But I’ve been having a hard time recently, increasing the mileage as I prepare for the Great North Run. As my long weekend runs get longer, I’ve reminded myself that 13.1 miles is a long way. And I’ve struggled to find both the time and motivation to fit in the midweek runs of 10k and more that are on my training plan. So, time to shake things up a bit. And this week I received a Tune Belt to test out. The Tune Belt is basically an arm band with a pocket for your mobile phone. It has a plastic cover, so you can still see the screen and holes at the bottom where you attach your headphones. It felt very comfortable as I adjusted the velcro strap to fit my arm. The material is soft but strong, like a very flexible neoprene. With an old running playlist lined up and my headphones in, I hit the road for an early morning run, with a target of 12k before breakfast. Having some get-up-and-go music in my ears certainly encouraged me to head off at a good pace. And with the weather being pleasantly cool and still, I was enjoying one of my usual routes along the coast. A couple of miles in, I decided the playlist really was a bit cheesy and I’d prefer to run without it. I was able to stop the music by using my phone’s touch screen through the plastic cover and found I could tuck the headphones away under a little flap beneath the Tune Belt logo at the side of the pocket. I carried enjoying a good run on towards the lighthouse, just taking in the still morning and listening to the sound of the waves. 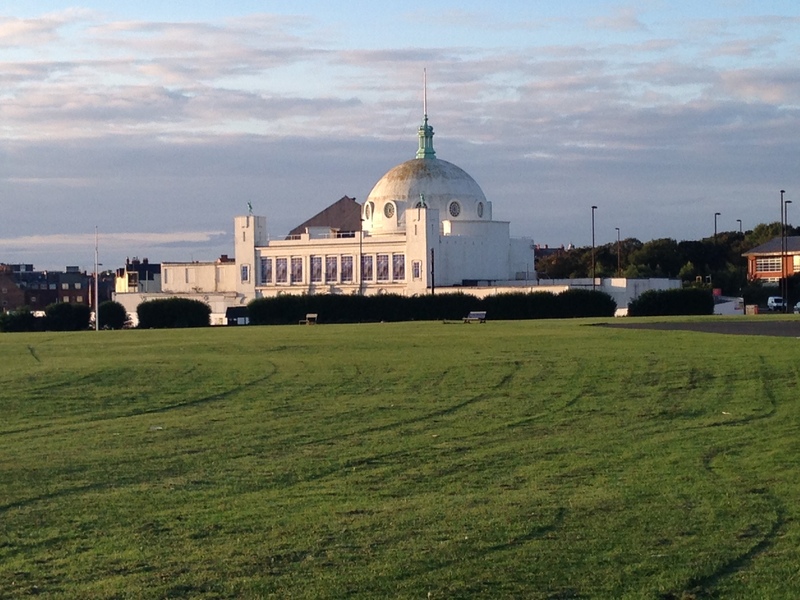 As I turned back, the early morning light was perfect for me to take a snap of the famous Spanish City Dome in Whitley Bay, where I took part in a triathlon last weekend. I had to take the phone out of its pocket for this, but it was a great chance to capture my lovely running scenery. I only paused for a few seconds – enough to take the picture and choose some classic Bowie as my get me home playlist. I bounced along managing 12k or just short of 7.5 miles relatively comfortably before heading home for a shower, breakfast and then the rest of my day. I like the Tune Belt. It’s neat, simple and does its job. It was very comfortable to wear. I always felt like my phone was secure in its pocket and didn’t bounce around at all, so there was no rubbing or chafing on my arm. In fact, when I didn’t have my headphones in, I could almost forget it was there. Of course, you don’t have to use your phone to listen to music when you’re on the go. 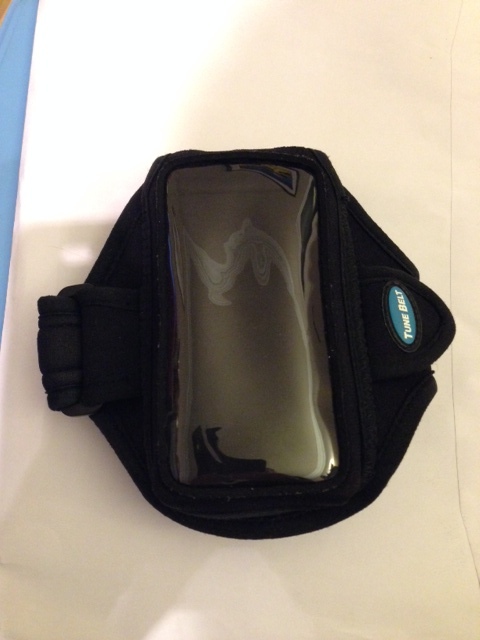 But if you want to carry a phone when you’re training, running or cycling, this could be a good way of freeing up a pocket and giving you easy access to it if you need it. Although it has a plastic cover, it’s not designed to be waterproof, so you’d be taking a risk in a heavy downpour, but otherwise it would seem to do a good job. 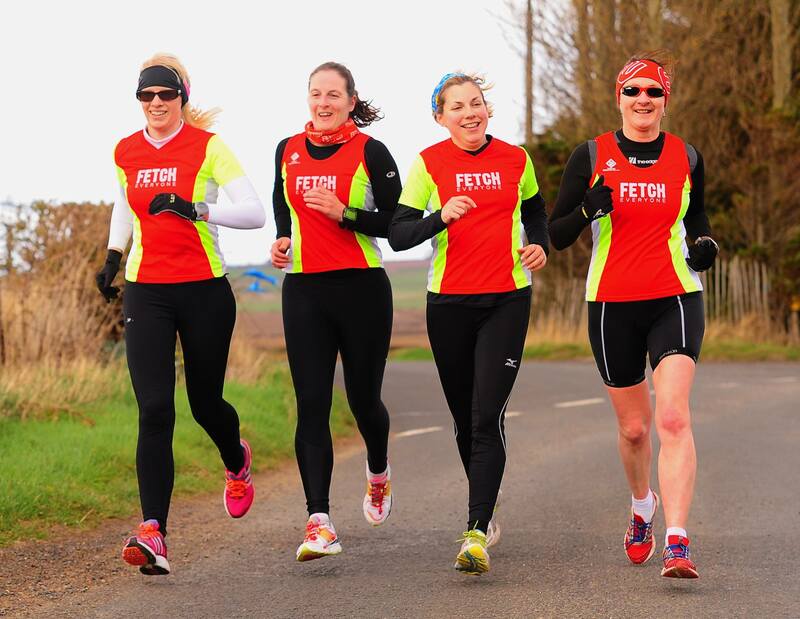 Saturday, sunshine, blue skies and a trip north, over the border to Scotland for the first tri day of the year, hosted excellently as ever by my fab tri buddy Lesley. These often happen midweek, so despite it being the weekend, I still felt like I was skiving off as I put my bike in the car and drove north on a practically traffic free road, casting admiring glances at the calm blue seas off the coast. I must have had about three complete changes of outfit packed in my huge tri bag, in anticipation of any kind of weather, but it was very kind to us. With me, Lesley, Al, Lucy and Cat all arrived safely, we headed off for a pool swim at Haddington. With the pool shortened, it was a good chance for me to try out some of my coaching and Swim Smooth tips and to suggest drills that would help improve the efficiency of swimming strokes. It’s amazing what you can learn from watching other people swim and see all the different styles and learning techniques. I had them doing doggy paddle, sculling, torpedo push offs and swim backs, and I did some 6-1-6 and catch up drills using a High 5 tube, which I passed from hand to hand. It worked very well, but I’d forgotten how hard those drills are. I need to make sure I spend a bit of time doing them. I did get a bit of a swim in, but no great distance. It was just lovely to be in such a bright, airy pool. And reminds me I do need to make time for my swimming as I do enjoy it. After a bit of a refuel with flapjack from the cafe, it was back to base and change into cycling gear for the main part of the day. Much faffage and discussion about how many layers and pumping up of tyres, but we were soon on our way out onto the quiet and largely traffic free roads around North Berwick. The best thing about these rides is that no one gets left behind. We all enjoy a nice cycle, stop and regroup at junctions, push on and fall back when we need too. 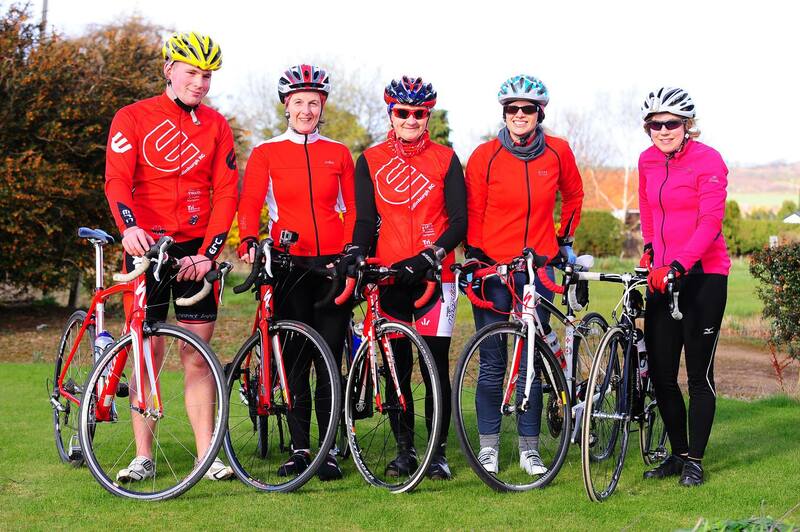 This time everyone seemed to be at a similar level of cycling and it was very pleasant just moving along, spotting swathes of yellow daffodils, passing a couple of horses and chain-ganging down a lovely smooth stretch of road. Last time I rode this route, we got hit by a horrendous head wind in the last 3 miles, which was so bad one of our party actually got off and walked. It wasn’t quite so bad this time, but still tricky enough to slow us down and send me rattling down to my lower ring. I can still feel a flush in my cheeks and on my forehead today from the wind burn! But we all made it back in one piece and us girls did a quick change around for a bit of a run while Bob took some great photos and Al made sure we’d have soup ready for our return. It was great all running together in our Fetch tops and we stuck together for one lap of the trail loop and did our best Runner’s World pose at the end for another photo. How could 4pm have come round so quickly? It felt like we’d only just got started, but we were all hungry and soon devouring soup, bread, spreads and cake and flapjacks. Yum! They say time flies when you’re having fun. It certainly did for me. Even cycling, which I usually get bored with in less than an hour, felt relatively easy and carefree. The chat flowed, the sun shone and it was all over too soon. But, as always, it was just one of the best days. The forecast was not favourable for Newcastle parkrun this morning. Overnight rain and freezing temperatures bring ice to the exposed moor and just after I parked up, I learned it was off. I’d arranged to meet my friend Tove for a post parkrun swim, so I walked over to the start, spreading the word to those arriving and catching up with her as she appeared on her bike. Neither of us fancied hanging around for two hours before the nearby pool was open for public swimming, so we deferred our session for another time. I could have done a freedom run I suppose, and a good few did choose to take their chances over the slippery paths, but I decided to save my legs for a long slow run tomorrow and went to swim at my gym instead. I fancied a long slow swim. There’s been a 1500m set sitting glaring at me from my plan this week. With the pool nice and quiet and the lane empty, it looked like a good shot. So, slow and steady was my mantra, a few easy lengths warm up and then into the big swim. I swim in a 20m pool so 75 lengths was the order of the day. I broke it down into 3 x 20 plus 15 but I wasn’t intending to stop, just to use this as an easy way to count up the distance without it becoming overwhelming. During my first 20 lengths, I spotted a man bringing out floats and swim noodles and other bits of kit and putting them at the side of the pool. I figured there were some kind of lessons or an aqua class about to start. So, after my first 20 I stopped and asked him if I needed to move out of the lane. He explained that it was a babies swim session, so they’d be using the swim lane and I moved into the main pool. I started again, reasoning to myself that if it was hard going or I felt particularly achey, I could count that first 400m provided I swam the rest continuously. But I settled into a nice easy rhythm, kept it slow and steady and by the time I’d done 1000m, I knew I could manage the last 500m to make it a genuine continuous swim. Swimming up and down to the sound of ‘Twinkle, twinkle little star’ and ‘Wibble wobble, jelly on a plate’ as well as baby noises from the next door lane was quite a new experience. But I just focused on my swim, visualising a smooth blue ocean and swimming in gentle waters. I let myself really relax, which meant my form was a bit scrappy and I went back to lifting my head further than I need to, but I’m trying just to focus on one thing at once when I swim. This was about keeping going over the distance. Next time I’ll do some shorter sets and be stricter about my form. With the additional 400m and a bit of warm up and cool down, it meant my swim overall was just over 2k in 51 mins. And the 1500m took 34:35, which I’m pretty chuffed with as that was a very comfortable effort level and I know I could increase that to go faster. But it’s all about building and training for whatever it is you’re focused on. I can still remember the achievement of running 2 miles non stop and my first continuous 400m swim which I guarantee left me more out of breath than today’s 1500m. So today, I’m really pleased that I can get in a pool and do 1500m front crawl. That I can relax and control my breathing so that I don’t have to think about it so much. I know that not so long ago, I couldn’t do that. So, fellow swimming tiddlers, I just want to say you can do it. I’ve been there, coughing and spluttering and clinging to the side like a fresh-landed haddock after a length or two. It takes time and practice, but if I can do it, you can too. Each swim is a lesson and each stroke a movement forward. It’s been another good year of training and competing in triathlons and road races for me. And it’s good to look back at what I’ve achieved as well as planning for the future. That’s a total of 283:48 training or racing hours in 2013. It’s the most I’ve ever trained in one year. And I completed 6 triathlons in 2013, including my first two Olympic distance events and my first sea swim. My swimming improved thanks to some training sessions with my PT early on in the year as he trained for his coaching qualification. I’ve spent more hours and done more miles on my bike than any other year and enjoyed it more than I have before, especially when I’ve had the chance to go riding in Scotland with my tri chums. I have walloped time off in my second season of triathlons, including a 10 min PB at the QE2 sprint triathlon, with improvement in all three sections. There was another memorable day at the Olympic Parkrun. It was an amazing experience to do it the first time, so to go back, post the Olympics, with my expectations high … well they weren’t disappointed. And the Blaydon race is still my favourite event, particularly as I managed to go under 50 minutes this year. I’ve enjoyed volunteering at parkrun and I know I’ve inspired a few people to dip their toes into triathlon. With no races longer than 10k, it’s inevitable my run mileage was down on previous years, but that will change as I take on a half marathon again in 2014. I wanted to find a better balance in my training and to give myself a season with a true tri focus. It did pay dividends as my tri times improved and I felt more confident swimming in open water and taking on the longer distance events. But, as always, there are areas for improvement. I did miss taking part in the Great North Run in 2013. It was lovely to see all my friends and shout encouragement from the Tyne Bridge, but I did feel like I was missing out on the party, even on a cold and dreary day. So I’ll be back in again in 2014. The challenge will be to switch from tri focus at the end of July to get myself in shape to run 13.1 miles by the beginning of September. I’ll see how I feel nearer the time as to whether or not I set myself a time goalIn 2014 I want to maintain a good balance of training hard but not putting too much pressure on myself, and most importantly to enjoy my training. I’ll pick my key races to go hard, and others I’ll do for the experience or the fun. There will be a good mix of challenges, including my first ever river swim in the Tyne. My first race isn’t until April – and right now that seems a long way away. But it will soon come around. I’ve entered a few popular races already and I’m sure I’ll fill up my calendar with a few more as they open up for entries. I’m looking for another standard triathlon – preferably one that I can easily travel to from the North East of England, so any suggestions are welcome. I’m also currently on 76 parkruns, so only 24 away from 100. It would be great to achieve that in 2014, but I need to balance them out against other training and races. And of course, I’ll be doing my fair share of volunteering too. Getting fit, starting to run and then taking on the challenge of triathlon has really changed my life over the past six years. I’m sure I never imagined achieving a fraction of what I’ve done when I first stepped out onto the beach and tried to run a length of the sands. It’s taken me to some great places, given me some amazing experiences and brought me life-long friends. Oh, and made me fitter and healthier too! So if you’re thinking you want to make some changes to your life, I can thoroughly recommend it. Just remember, start small – I couldn’t run a mile when I first started. Find something you enjoy, but that challenges you. Commit to make it a habit and go out and get moving! I’d been looking forward to it all week. The long run. Which these days, for me is 10k. I haven’t run much over that distance all year and the last time I ran it was at the Hellhole race in October. My training volume has really dropped off. September was understandable. No half marathon to train for and a much anticipated week’s writing in Adalucia. Time to slow down, and take stock after a full-on triathlon-focused season. But the drift has continued through October and November. No more early morning’s cycling before work. Too dark. Too dangerous. Running cut back to 30 minute easy jaunts at lunchtime out to the nature reserve to soak up some vitamin D and enjoy some running company. Thank goodness for my Thursday PT sessions which still remind me I have the discipline to get up and get out to train in the dark and the cold before the rest of the world thinks much about waking. They are my hardest workout of the week, but leave me feeling alive, awake and achey in a good way. So to the run. And boy, was it hard work. Even after a lie in until the light came through the window. Even after my porridge, breakfast of champions. No need for the buff wrapped round my neck to shield my ears. No need for gloves, dropped back through my letterbox as soon as I ventured outside and realised it would be fine enough to go without them, even at a moderate pace. And so, out onto a familiar path beside the sea. A china blue sky and no demands or expectations beyond the run. Steady to start, easy breathing, not pushing the speed, just trying to find a rhythm, warm through the muscles and set on my way. The watch worn, but I paid it no attention. I don’t even think I heard it beep. Runners and cyclists out smiling and nodding. I’m passed by a number and admire the speedy bounce of a young lad who I regularly see out here. My mind wanders as I pick up the paths by Spanish City. This already feels like hard work. How far should I go? The negative thoughts speak of tight knees, tight hips and plodding footfall. Remind me I have no distance this year, no running triumphs. Taunt me with ‘Good job you’re not planning a spring marathon,’ then dig the knife in reminding me how hard it will be to do half that distance come September. Because, yes, I’ve signed up for the Great North Run again. Hello monkeys. You haven’t come out to play for a while have you? Not while I’ve kept my challenges within my comfort zone. Now I must exercise my thoughts to banish my mental restraints. I had come prepared for this. I rarely run with music when I’m outdoors. But sometimes it’s helped break the stride of a long run. And I had my headphones tucked in a sweatband pocket. I stop at the bus stop and break them out. I instantly remember why I don’t run with music. The cord flaps until I get it the right length. The headphones drop from my ears. Then there’s that track on my run playlist that I don’t really like and keep forgetting to take off. But still the music is helping me pick up my feet, banishing the limiting, negative thoughts. Though now I have to pay attention to avoid the walkers on the narrow paths, approaching in silhouette, against the low sun. I plough on. Through the full set of niggles. Right shoulder, left hip, left knee. And then my right foot sets to pins and needles and I know, without doubt, that I’ll not shake it until I stop. This is meant to be fun. A treat anticipated since last Sunday. It doesn’t much feel like it. I start to do deals. Run for an hour. But that 10k distance will be mere minutes more, that an hour will feel like a cop out. In truth as always, I have to get back to where I started, run or walk – so I might as well run it. I’m about to take out the headphones, the music now fuelling my irritable dissatisfaction. But the next song starts with a familiar riff. Da….da,da da…da,da,da….Da! Come on man, it’s Rocky! I smile at the cheesiness and run to the driving beat. It makes me pick up my feet and my speed, when I thought I was just about all in. So I hit repeat and run until it finishes a second time, past the 10k mark and beyond. As it fades away I stop and breathe and stretch. I finished feeling like I wanted to go on despite those earlier rumblings. Hold that thought. Take that positivity into the next run. I set myself a goal and I got there. When I took on my first half marathon, I wasn’t running 6 miles in December. On my last standard tri, I told myself truthfully that I could run 6 miles before breakfast. It’s a start. A first step. Let’s see where it takes me.